Connects Composite video source to HDMI video monitor/projector. 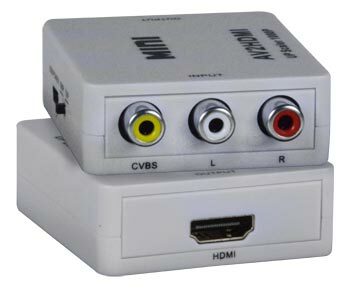 Connects video sources with analog RCA video connectors to HDMI monitors or projectors. Supports 1080p or 720p HDTV output resolutions. Three female RCA phono jacks (video, R&L) for Composite video and stereo audio input. Supported video formats: PAL, NTSC 3.58, NTSC 4.43, SECAM, PAL/M, PAL/N. One female HDMI connector for HDMI output. One female Mini USB Type A connector for power. Can be powered by a USB port on the display monitor or a USB PC. WxDxH: 2.17x2.60x0.94 in (55x66x24 mm). Supports HDTV resolutions of 1080p and 720p. Select resolution using the switch on the unit.